OTTAWA, ON –– March Networks®, a global provider of intelligent IP video solutions, today announced the results of an independent survey exploring how fraud, customer service and security perceptions are impacting U.S. banking consumer decisions. Key results from the survey, commissioned by March Networks and conducted by leading market research firm Ipsos earlier this year, reveal that 15% of consumers experienced fraudulent bank account activity in 2016. Banks and credit unions responded successfully, however, with 85% of those consumers saying they were satisfied with how their financial institution handled the incident. Survey results also show that a continued focus on customer experience remains critical for banks and credit unions when it comes to retention, with 1 in 5 respondents (and a higher 1 in 4 Millennials) confirming they have switched banks in the past because of poor in-branch service. In addition, banking choices are influenced by how secure consumers feel when conducting transactions, either in their local branch, at an ATM or online. A majority of consumers (98%) felt most secure when conducting transactions at their local banking branch, compared with 92% when conducting transactions online and 85% using a mobile phone app. Further, 90% of consumers said they feel safer when they can see video surveillance cameras in their bank or credit union, and would choose a financial institution with surveillance over one without, all other things being equal. For nearly two decades, March Networks’ intelligent video solutions have helped many of the world’s leading banks and credit unions address real-world business challenges efficiently and cost-effectively. More than 500 financial institutions rely on the company’s solutions to enhance security in their banking branches, corporate facilities and at ATMs; proactively identify and reduce losses from theft and fraud; and improve operations and corporate policy compliance. Using March Networks’ video-based business intelligence software, which integrates video with transaction data and analytics, financial institutions are also realizing significant improvements in customer service, workforce management and operations. 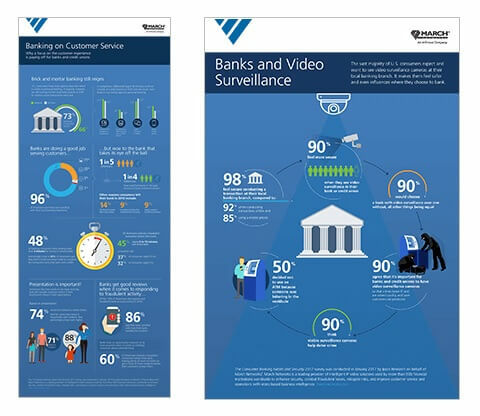 See additional survey results online and view the Banking on Customer Service and Banks and Video Surveillance infographics. March Networks and the March Networks logo are trademarks of March Networks Corporation. Infinova is a trademark of Infinova Corporation. All other trademarks are the property of their respective owners.